I have introduced three precious interviews/essays by Hirasawa fans from abroad since I started this blog, "Denshi Furu Nikki", and they have been some of the most popular contents of this blog among its readers. They are: 1.Interview to and 2. Essay by Osamah from Saudi Arabia, and Interview to Inu-Fuusen(Cano) from Shanghai, China. This time, I introduce an interview to Bryan Gonzales from Peru, presently living in USA, who is a huge fan of Susumu Hirasawa. This will be the fourth article of such kind. Bryan answered to my 17 questions. Lucy translated English into Japanese for me. I hope you all enjoy reading it. I was born in Lima-Peru, and at the age of 18, my parents sent me to the US to study. After 5 years of college, I continued my stay in the US because I got offered a job in a software company. I am now 28; it's been 10 years, and I can't believe how fast time has passed. 【2】How did you know about Mr. Hirasawa's music first? While I was looking at this question, Hirasawa-sensei's song "Love Song" was playing in my computer. Isn't it a serene and perfect way to start talking about his music? My story is a little similar to the one from our dear friend Osamah. It was thanks to the animation show Berserk. One of the differences with Osamah's story is that nobody told me to watch Berserk. During my last year of college, I used to go to an anime store which had a huge collection of anime DVD series. One day, I saw the DVD box of Berserk, and it got my attention. Usually, when I saw a cool DVD box set, I used to first check the internet and see the reviews about the show before buying the DVD. However, that did not happen with Berserk. I looked at the DVD box, grabbed it, paid it, and then I took it home. When I watched the show, I fell in love with the soundtrack "Guts". The song gave me a mix of emotions: loneliness, peacefulness, uncertainty, the feeling of being lost... the song represents being in harmony with the universe. Of course I cannot forget "Forces" and its marching rhythm, which gives you the strength to conquer any difficulties. I think it was probably "destiny" that led me to watch the show, which granted me the joy to discover Hirasawa-sensei's music. 【3】The United States of America is probably the next easiest country to Japan to live in if you want to have an access to Hirasawa music and information on his live shows and new releases. Do you feel the same way? Do you feel easier now, living in USA than living back home in Peru, in accessibility to Hirasawa music? You are correct. It is easier for me to buy Hirasawa-sensei's CDs and DVDs from the USA. Regarding the information about his new releases and live shows, I think it would be the same if I am in Peru. Nowadays, with the Internet, you can access information from anywhere in the world. Peru is getting influenced a lot by the Japanese anime & manga culture. There are malls that are dedicated to Japanese merchandise, including food. I went to one of them during my last trip to Peru, and you can even see people cosplaying, just like in Japan. Thanks to all of this influence, you can also have access to J-Pop and J-Rock music. I tried to find Hirasawa's music, but the closest CD I could find was the soundtrack of Berserk. At least the guy in the store could relate Hirasawa-sensei with Berserk. I also used to be part of a hispanic group in facebook that followed Hirasawa-sensei's music. The leader of the group was from Chile, and the members (around 40 people) were from different hispanic countries, mainly from Chile and Mexico. Unfortunately, the group doesn't exist anymore, because the leader chose to abandon the group, which caused the group's closure. 【4】Are you a 'Techno' person? I like and enjoy Techno, but deep within my soul, I am a "classical" person. I love classical music, especially if it is piano-based. That is why "Philosopher's Propeller" is one of my favorite albums of Hirasawa-sensei. It is the perfect combination of classical, electronica, orchestral and Asian style music. 【5】Could you tell me the names of 5 Hirasawa fans you know, living outside Japan, whom you admire the most or who impress you the most, for being enthusiastic Hirasawa fans. I didn't physically met Oliver. He is the guy from Chile who ran the Hirasawa group in facebook. In all of his posts, he truly reflected his passion for Hirasawa-sensei. To be honest, he was a closer follower, way more than me. Sometimes I used to wonder how he had the time to explore and browse the internet to find information about sensei. When I told him that I went to see Sensei to Japan, he almost fainted, and asked me all the details, even my trip expenses because he also wanted to go see him someday. Since the group on facebook closed, I haven't heard from him. Looks like he is taking a long sabbatical. Andrew is a Canadian guy. I'll tell you about him in the question about "friends who I talk to about Hirasawa in USA". I am proud, and at the same time, jealous that Osamah has almost all of Sensei's CDs and DVDs that are available at Chaos Union/Teslakite web site. He has showed me that, like any good fan, knows a ton about Sensei. I got the pleasure to meet him during the Phonon 2555 concert in 2012. We had a good conversation about our devotion for Hirasawa-sensei's music. I look forward to meeting him again. 【6】How famous is Mr. Hirasawa in USA? Hirasawa-sensei has become quite famous in the US due to the anime works from Satoshi Kon, mainly from 'Paprika' and 'Paranoia Agent'. The anime 'Berserk', originally written by cartoonist Kentaro Miura, was another hit that also gave our Sensei a high recognition for the soundtracks of the series. Many people, including myself, think that Sensei's music gave life to the series. Without it, I don't think the series would have given the same impact and resonance to the viewers. 【7】In USA, do you have any friends around you who you can talk about Hirasawa music? Not really.... until Andrew Polidori showed up. Andrew joined the company I work 2 years ago. It was an interesting story how we discovered that we both knew about Hirasawa-sensei. I have a friend at work, also Canadian. One day, she introduced me to Andrew. She felt proud that there was another Canadian at the company. So one day, she invited me and Andrew for lunch. At lunch, my friend tells Andrew that I like to travel and visit places outside the USA. This is when I told him about my trip to Japan, and said that I had been to a concert to see one of my favorite singers. I could see Andrew was intrigued and excited about my trip. So he asked, "What kind of music does he play?". When I started to describe Sensei's music, he said, with a surprised look: "Is it Susumu Hirasawa?". I couldn't believe it! I was surprised and excited that there was somebody else that knew about Sensei! We instantly became friends, and talked about sensei whenever we had time. Unfortunately, he had to move back to Canada to finish his studies, and I haven't seen him since then. Hopefully, we'll meet again at some point, when he comes back to the USA. Now... a big surprise for all of you... about another person I talk to about Hirasawa-sensei... My mother. My mom's name is Gabriela. I made my mom listen to Sensei's music since i started to listen to him. My mom liked it immediately. She became another big fan of sensei, always asking me if a new song came out, or if something is going on with Hirasawa-san. She says, "I find peace with his music, I encounter the tranquility I need during the day by listening to him, even though I don't understand the language." Her favorite albums are 'Aurora', 'Sim City', 'Siren', and 'Philosopher's Propeller'. I always buy them through Testlakite. For me, it is the easiest way to access and purchase Hirasawa-sensei's works. 【9】Which do you like better, Hirasawa solo, or P-MODEL/Kaku P-MODEL? I like both! Please don't make me choose.... alright alright. I have a preference for Hirasawa solos. 【10】Why do you think you chose especially Susumu Hirasawa's music out of many kinds of music in the world? I know if might sound strange that a non-Japense person like me greatly enjoys Japanese music, and not just any Japanese music. Hirasawa-sensei has a very unique style in his compositions. His music is like invisible strings that pull you into a different state of mind, a different universe, a far away land that at first feels unknown, but somehow, little by little, becomes pleasant and familiar. I lose myself in his music. To me, because I don't fully understand the language, Hirasawa-sensei's voice becomes another instrument in his songs. His voice is like the last brush of paint in a colorful painting, the one that marks the complexity, yet perfection, of the painting. Another thing I like a lot about him is that he is constantly inventing new technology to make music. You can see how he evolved through the years. For example, I loved the concept he had behind Solar Ray, where he powered his instruments with solar energy. His music always keeps getting better and better, you can definitely see how he matures over time. He always takes his music to the next level, one step further ahead. 【11】Do you have favorite musicians who you can recommend to your friends other than Susumu Hirasawa? - If you like techno music, listen to the mexican band "Moenia". Look for their albums "Stereo Hits" and "FM". - If you like ambient, post-rock, and art-rock, listen to the icelandic band "Sigur Ros". I would recommend starting with their album"Takk". I am a 70s and 80s guy, meaning that I like to listen to the music from those years, especially from the 80s. Obviously, Devo's music is in my 80's playlist, and I continue to enjoy the band's music until this day. To me, the best music arrangements, rhythm, and melodies were made during those years. The 80s was filled with lots of innovation, and has influenced a lot to the artists of today. 【13】What was your impression on Japan when you visited Japan in June, 2012? To prepare for the trip, I studied japanese for a couple of months. I downloaded some lessons from the Internet, and I got to learn all the hiragana and katakana, along with some basic expressions. I wanted to merge with the japanese culture as much as I could. I don't have words to describe what my reaction was when I arrived at Japan. When the plane landed at Haneda airport, I was still telling myself "Am I really in Japan? Am i really here??" I still wonder if in my previous life I was Japanese. In all honesty, I can tell you that I felt as if I was home. My trip was very short, only 3 days, but I got to visit Hakone and Mount Fuji, and of course, the city of Tokyo. I also got to ride on the bullet train. The few places I got to visit showed me how beautiful the country is, and how polite the japanese people are. I definitely want to go back. I would like to go to Kyoto, as well visit my good friends Eriko and Sumire in Fukuoka. 【14】What do you remember about Phonon 2555 live show in June, 2012? Literally, it was one of the best days of my life. Being in Japan, and mainly, being at Hirasawa-sensei's concert! The first person I met was Takara-san. She was very nice to me, and helped me reserved a ticket for the concert. Instantly after that, I met Sabrina, and to be honest, I was surprised to see an american girl working for Hirasawa-sensei. Right after that, I met Osamah, and then the four of us (Takara, Sabrina, Osamah, and me) took a picture. I have that picture saved as a memento of the concert. When the concert started, I saw sensei come to the stage, I could feel how the adrenaline started to rush in my body. I was finally seeing him live! A dream come true! You might laugh at this, but i still feel as if it was a dream. It was a big deal for me, coming from far away, only to see Hirasawa-sensei. I sang, yelled, and danced to Hirasawa's songs, especially with the concert's opening song "Haldyn Hotel". 【15】I heard you have been to Trujillo(which is a city sung in the famous Hirasawa's song "Haldyn Hotel"). Tell me what you thought about the city during your visits. Trujillo is a city in the north of Peru. My uncle took me and my brother there for a quick vacation when I was 15. I went a second time during a school trip when I was 17. The weather there is most of the time warm, not too hot. That is why people call it the city of the eternal spring. Aside from that, it is the home of a great culinary tradition. You can eat the best fish dishes, being "Ceviche" the most popular one. The city has many touristic places, including ruins (for example, Chan Chan) of ancient peruvian civilizations. In overall, I liked the city, but it is not my favorite one in Peru. 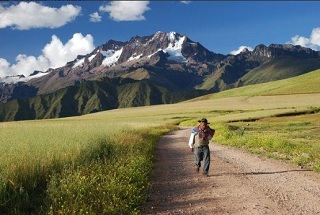 To me, Cuzco is the most beautiful one. Now.... I wonder why Hirasawa-sensei chose to mention "Trujillo" in his song "Haldyn Hotel". Hopefully, if he reads this, he can tell us the reason behind it. （English translation）First of all today, I share these wonderful photos. I want to thank Mr. Bryan Gonzales who sent them to me. And I am astonished! 【16】Please say some words to Hirasawa fans in Japan. I look forward to meet more of you in a future live concert. As I said before, I want to go back, so I gotta start saving now! One of the things I would love to do with all of you is to go to a karaoke and sing Hirasawa songs! I am very happy that you have a great musician living in your country. You should be proud that he is Japanese. Please, continue to support our sensei, and let's make sure that everyone in the world knows about his music! 【17】What would you say to Mr. Hirasawa if you could say something to him? Sensei, I can't thank you enough for creating such great music. You are truly a master at what you do, it is the perfect example of somebody that has fulfilled his passion. Your music reaches my soul, and I'm sure it has the same effect on everyone else. Please do not stop nurturing our ears with your melodies. I'm a 100% sure that your music will keep crossing boundaries, and many more people will acknowledge your work and music greatness. Remember, you are a genius. As you can see in this interview, Bryan attended 'Phonon 2555 Live Show' in Tokyo in 2012.